The dramatic decline of some frog populations is directly connected to global warming, a new study claims. The scientists looked at biodiversity hotspots in Central and South America, and found compelling links between frog extinctions and changes in temperature. 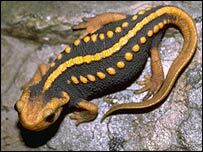 They believe the perfect conditions are being created for the spread of a fungus that is deadly to amphibians. The international team, reporting its findings in Nature magazine, says the impact on biodiversity is "staggering". 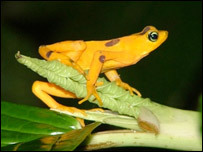 Its research focused on the vividly coloured harlequin frogs (Atelopus) which are critically endangered. Between the 1980s and 1990s, almost two-thirds of the 110 known species became extinct, and a chytrid fungus (Batrachochytrium dendrobatidis) has been suggested as the prime suspect. The scientists compared the last known sightings of the frogs with recorded sea and air temperatures, and discovered strong correlations. They propose that climatic changes are leading to outbreaks of disease caused by the chytrid fungus. The fate of amphibians has previously been connected with the chytrid fungus and climate change, but scientists were puzzled because the fungus is known as a more effective killer at lower temperatures rather than the higher temperatures usually associated with global warming. But scientists now believe they have unravelled the mystery. General warming is causing extra cloud cover over the tropical mountains favoured by the harlequin frogs. This means cooler days locally and warmer nights, providing the conditions in which the chytrid fungus thrives. This was further confirmed by the fact that species of frog that live at very high altitudes where temperatures are very cold, or very low altitudes where they are very hot, have a much better chance of survival than the frogs that live half-way up the mountain. "We have found evidence that global warming is causing widespread amphibian extinction by triggering outbreaks of disease," said lead author Dr Alan Pounds. "Night-time warming and day-time cooling means that you are producing conditions more favourable for the fungus," the scientist from the Monteverde Cloud Forest Preserve in Costa Rica told the BBC News website. He added: "We need to act quickly. Disease is the bullet killing frogs, but climate change is pulling the trigger. The bottom line is that we've got to move to cleaner energy sources." The chytrid fungus is found throughout the world, possibly carried by invasive species such as bull frogs. The fungus clings to the skins of amphibians, causing a disease called chytridiomycosis. 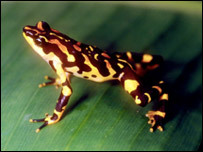 It has been implicated in the extinctions of many species of amphibians; although how it actually kills them is unknown. A summit was recently held in Washington DC to discuss how to curb the global decline in amphibians; nearly a third now face extinction. Delegates said a better understanding of how the fungus spread and killed amphibians was critical. Dr Trent Garner, a research fellow at the Institute of Zoology, UK, told BBC News: "This (latest) study is significant and it generates a theory that we can now test experimentally. "This fungus is causing species declines throughout the world and dealing with this disease emergence requires a serious research commitment. "Climate change is a global phenomenon, and is causing changes in ecosystems around the world. I would imagine that there are other places, such as Australia or North America, where climate change is leading to conditions that either aid chytrid growth or immunosuppresses amphibians."